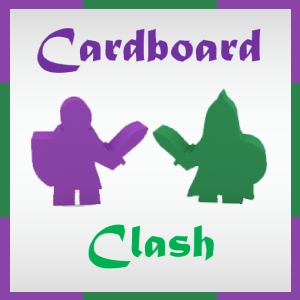 Thank you for checking review #75 by Cardboard Clash. My aim is to focus on reviewing board games and how they play for two people and, on occasion, how they play for one person. Because my wife is my primary gaming partner, a lot of consideration goes into finding those games that play well with 2 players, and we typically prefer to find those games that do not require a variant (official or otherwise) in order to play it with just the two of us. Hero Realms is a game designed by Robert Dougherty and Darwin Kastle, and was published by White Wizard Games in 2016. The box states that it can play 2-4 players and has a 20-30 minute play time. Hero Realms is a fantasy-themed deck-building game that is an adaptation of the award-winning Star Realmsgame. The game includes basic rules for two-player games, along with rules for multiplayer formats such as Free-For-All, Hunter, and Hydra. This is a fun, fast game that is everything I want out of a deckbuilder. The setup and teardown time is quick, so I can pull this out at a whim and be playing within minutes. The rules are simple and easy to teach, yet there is a vast amount of complexity within the game itself in terms of strategies you can take. There are easy ways to increase damage, regain life, draw more cards, and to thin your deck. You are interacting with your opponent because you are trying to destroy them, and there are some ways that you can slow down your opponent’s attacks apart from trying to regain a ton of life. This one little box provides an experience that is incredibly fun and has plenty of replayability. Speaking of replayability, the factions seem to be a little more balanced in this game than Star Realms. I have no concrete evidence, but they there doesn’t seem to be an obvious mono-faction that is all power or all healing. There are definitely still areas where each faction is stronger, but overall this seems to do a better job of spreading out those desirable traits to encourage branching out. I love the change on how Champions are used. They are far more interesting than Bases in Star Realms, despite providing almost the same effect. The real kicker is they get tapped to be used, meaning your opponent has opportunity to take them out of the equation for a turn. It also makes it easier to see and remember if something has been used. The art and theme in this version of the deckbuilder hold a stronger appeal to me personally than ships in space. I’m definitely not going to be the only one who finds that to be true and, if all other things between the two games were equal, the theme in this would help it make a case to be in my collection. This one is just more fun to look at while on the table. The health tracking cards are significantly improved compared to Star Realms, and are definitely something I am willing and able to use during gameplay. My wife still isn’t a fan of the method, but I find it to be intuitive and easy to navigate during gameplay. One of the big differences you can feel during Hero Realms is how greater the spikes in power are. On one hand, it feels amazing to drop epic damage in a round. On the other hand, the slow burn and building of a deck in Star Realms allows a slower build to hit its stride. Is it a horrible problem that this game can eat health faster? Not at all! It was something that kept me from the game for a long time, but I shouldn’t have stayed away because it rarely is a downside to the gameplay. In fact, it can help keep the pace flowing to where the game avoids dragging on forever. One thing I don’t understand about Champions is how they untap at the end of your turn. So you use them, and then they refresh in time to block everyone else’s turns. It is counter-intuitive to me as a player, and it took a little time to wrap my head around the concept. If you’re used to playing games where things untap at the start of your turn, too (and I bet you are), this might be a struggle for you to remember as well. At least for the first games. The biggest complaint that could be said is that it doesn’t do anything new or revolutionary in the base game box. This is essentially a reskin of Star Realms, which at its core was a simple combination of deckbuilding and PVP card game combat. Happily, there are expansions that branch out to open up assymetrical starting decks and powers, boss battles, and a campaign to play through. Unfortunately, those require additional purchases and take an inexpensive entry point and makes it on par with a bigger box game for a buy-in to get the best value and mileage for the game. I held off on even trying Hero Realms for a long, long time. I owned and loved Star Realms so much and heard whispers about Hero Realms that made me resist trying it for so long. And yes, it definitely can have far greater spikes of damage in this version (the main drawback I strayed from) but when playing the game it is far from feeling like a problem. In fact, it actually allows this game to have a better tempo than Star Realms, relying less heavily upon needing to go mono-faction from the market to have an engine that churns effectively and providing ways to still drop enough damage on the turtle-heavy strategists.. When comparing just base game Hero Realms against base game Star Realms, there aren’t many differences outside of the theme. Hero Realms provides an art style that is brighter and will have a strong appeal. It offers faster (in general) matches to let this thrive as a best-of sort of game on the shelf. It also provides Champions, who are similar to Bases in the Star Realms game but actually do something besides just a passive benefit. There are smaller Champions, bringing a great variety of them to the table. Ultimately I came to like and appreciate Hero Realms even more than I expected. I still enjoy, and would gladly play, either game. They scratch the same itch, at least in base form. This system remains one of my favorite deckbuilders out there, far surpassing the likes of Dominion and Marvel Legendary. However, the problem with Hero Realms is that there is more than just the base game and you’ll want to expand it. However, as you’ll see soon, that is a good thing because it adds a solo mode that is better than Star Realms’ version, character classes for unique starting decks for all players, and even boss battles allowing a 1 vs Many scenario of battling that is a ton of fun. For the entry price, this game is hard to beat. If I had played this one more prior to my Top 25 list, it definitely would have made an appearance on that list because it does all the right things that I want this small, portable deckbuilder to accomplish. And with more expansions in the near future, there isn’t a better time to consider playing Hero Realms and seeing if it is right for your collection. Hopefully you found this article to be a useful look at Hero Realms. If you’re interested in providing support for Cardboard Clash so I can continue to improve what we offer, check out my page over on Patreon: http://www.patreon.com/CardboardClash.